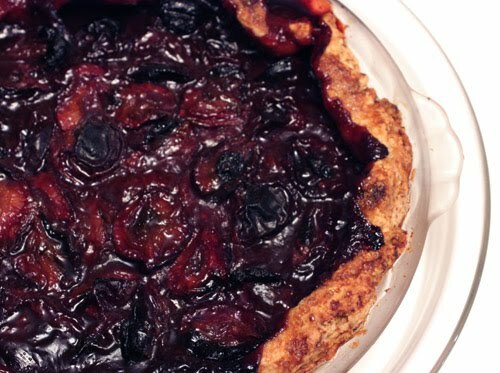 First, I saw this plum and port crostata on the very last page of the August issue of Living magazine, and then I spotted Italian prune plums in the grocery store. Little, egg-shaped, Italian prune plums seem to pack a full-sized plum’s amount of flavor into a smaller parcel. For this crostata, they were mixed with a reduced ruby port syrup, and that sounded like a such a good idea, I knew I’d like it just by reading about it. There are two slightly unusual things about this recipe. One is that one half of a seeded and minced Thai chile is an optional ingredient. That was intriguing to me, so I included it, but the flavor was lost in the port syrup. The plums and syrup were so lovely together I don’t think I’d bother with it next time I make this. The other interesting thing is that a pie dish is suggested for baking the crostata rather than letting it be more free-form on a baking sheet. I went ahead and used a dish in case the plums and syrup needed to be supported to prevent a runny mess, and that was probably the point. The syrup does set up by the end of the baking time, but there’s a fair amount of liquid as it starts to bake. So, the dough was rolled and placed in a baking dish and left to chill while the syrup was made. Ruby port and brown sugar were heated in a saucepan and left to reduce to about a third of the original amount. Once cool, that reduced syrup was stirred into a bowl with the halved and pitted plums, more brown sugar, salt, cornstarch, and cinnamon. That mixture was placed in the pie shell, and the dough edges were turned inward and then brushed with cream and sprinkled with turbinado sugar. The crostata baked for two hours total which seemed like a very long time, but it worked out fine. 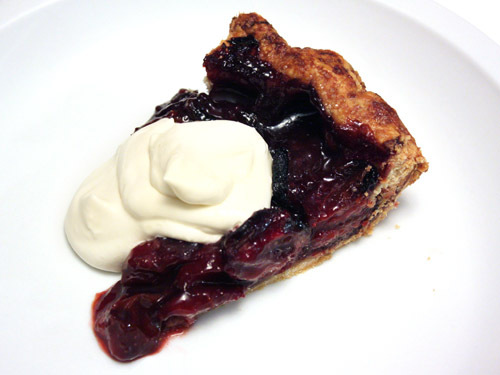 The once juicy filling was bubbly and thick when it emerged from the oven, and the house was filled with the incredible smell of baking plums. I was sure this was going to be delicious, and it did not disappoint. The port prevented the syrup from being too sweet, and it mixed with the flavor of the plums perfectly. Italian prune plums won’t be around for long, in fact, I didn’t see any at the grocery store yesterday. Next time they appear though, I’ll be ready to greet them with this recipe in hand. Miammm, delicious. Love this little sugar plums. oh, we just had these at the market too. last year I cooked them with sausage. But, I would have liked to have this. Yum!!! I love the deep color of plums. This is one fruity-licous dessert. Or in my case... an afternoon snack. I wonder what would happen if I stuck in my thumb? Gorgeous! I love Italian plums, but I haven't seen them yet! Love the colour, I just want to dig in! I love these very fruity and juicy tarts. A fabulous combination! That tart looks so mouthwatering! I'm drooling over your dessert. What a great picture, that makes us want to eat it. A wonderful combination...just looking at this picture makes my mouth water. mmm, so rustic and SAUCY. the port reduction sounds like a fabulous component--it's something i've never tried. great treat! MMMMMM,...this is kind of the dessert that I was hungry for! It turned out beautiful, I soooo love plums. wow this is very plumy !!! I love tarts! This just the kind of fruit tart that I would continuously open the refrigerator door for just one more bite. 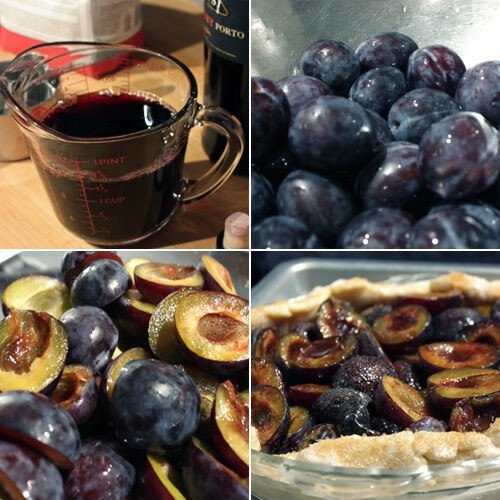 Beautiful tart, the combination of plums, port, & brown sugar sounds excellent! I am always drooling over when Barefoot contessa makes crostatas. One of these days I'm going to break and make one lol. Your pics are beautiful. Yum - everything about this dish is delicious! Interesting about the hot seasoning with such a sweet dessert! Yummie, plum tart! Looks so delicious! Man oh man this is yummy, plummy, get in my tummy good! Oh man! This truly is mouthwatering! Oh wow, Lisa! This looks and sounds so delicious! These are my favorite plums. My grandparents used to have a tree in their garden, so I always enjoyed them while growing up. I've never baked with them though. Looks like I am missing on a lot! This is perfect! I have plums coming out of my ears right now! Also, I have many many of those cookbooks I see in your logo at the top. Are you sure you didn't take that picture in my kitchen? Mmm... I just finished off a bunch of these with an almond cake, but if I can get my hands on some more, I'm making this. I've always wanted to make a dessert with port but never do because I never want to get port for some silly reason! But this dessert looks so good and perfect for fall that I need to rethink that! It looks and sounds sinful with it's deep, rich color and the addition of port wine. I can only imagine how delicious it was! What a beautiful treat - the flavor combo of plums and port sounds so rich and delicious! Oh wow - another perfect combo in plums and port. I can just see having this for a desert sometime soon!